39 year old Winnie Mou Solien from Gaire village in Central currently admitted at Angau hospital in Lae with cervical cancer at stage 2B needs overseas radiation treatment costing more than K50 000. According to husband Jerry Solien, he is aware that the K50 000 is only for the treatment at the identified Manila hospital but the travel and living expenses can total up to K100 000. Mr Solien said Winnie was referred to Angau last November from the Port Moresby General hospital and admitted on 02nd December 2016 and finally undergoing external beam radiotherapy last month on 04th January at the Cancer Centre. Mr Solien said given the current status of Winnie’s treatment now encountering added complications, she need’s overseas treatment once her current radiation treatment plan ends in a month’s time. 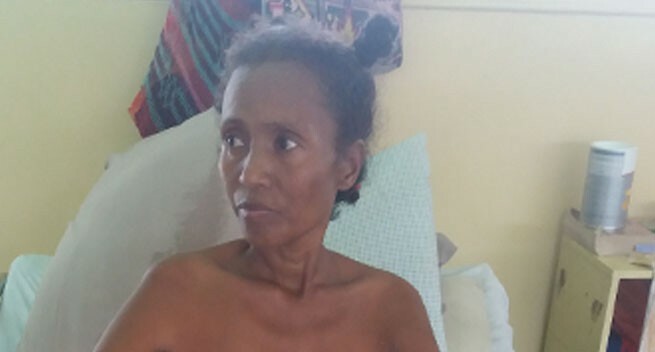 Mr Solien said he is now faced with the huge task of raising more than K50 000 to bring her wife to Manila for further treatment and the money is needed to be raised within the next four weeks only. “Otherwise the treatment is not complete after my wife completes her radiation treatment in Lae,” said Mr Solien. Mr Solien said the needed treatment is there but all he needs is the financial assistance to bring his wife overseas. He said so far he spent up to K6 000 to come to Lae seeking treatment. Mr Solien is appealing for much needed financial assistance from the public at this time and for more details to assist, you can call him (Mr Solien) as well her younger sister who is assisting to seek the much needed funds. Contact details are as follows; Jerry Solien phone number is 75349282 and her sister, Gini Segana Katrina Solien mobile number 79166279. Donations can be made to account number 6001460758, Westpac bank, Waigani branch and account name is Gini Segana Katrina Solien. According to the Doctor John Niblett, the only Radiation Oncologist currently in PNG, the late stage two of cervical cancer is not curative through surgery. He said if surgery is done the cancer will come back.